Last Summer, Cristyn and I went down to Poughkeepsie to talk with Barry Lam about cover songs. The episode of his podcast featuring us dropped today. Barry has other guests who address historical and musicological issues. I’m chuffed, though, that the distinctions form my paper with Cristyn and Christy provided the philosophical thread of the episode. The whole episode is genuinely interesting and engaging, and I think I’d say so even if I didn’t figure in it. I was actually surprised that I didn’t wince at hearing my own recorded voice, testament perhaps to Barry’s skills as a recording engineer. Was it fair to even call this band the Shaggs? Or was it, rather, a Shaggs cover band providing a live karaoke soundtrack for the Wiggins to sing along with? As someone who once judged a contest in which contestants tackled the question of whether a band can be its own cover band, I can’t let this pass as just a rhetorical question. There is a short review of Hi-Phi Nation in today’s Guardian, topped by a nice picture of host Barry Lam. Cristyn and I were in Poughkeepsie last week to talk with Lam about cover songs. He plans to do a show about musical covers. He called us because he had read the paper we wrote with Christy Mag Uidhir and we’re local. 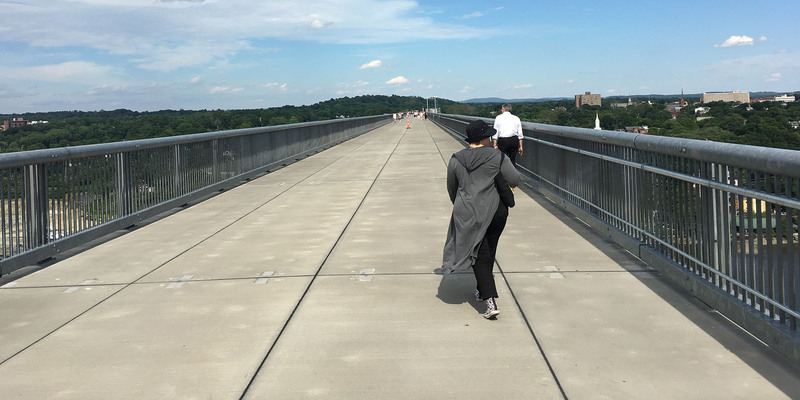 While there, we also took in the Walkway over the Hudson. I just finished reading Charles Bartel’s article “Rock as a Three-Value Tradition” (JAAC, Spring 2017) which develops on his 2013 post at Aesthetics for Birds.